A detailed sophisticated RC model of a Dutch tug, 650 mm long, with a Danish Billing Boats. Kit in a scale of 1:50 scale. Tugboat launched in 1965 under the name Maasbank for years served for years in the Dutch ports; Banckert received a new name in 1977. The actual ship had a length of 32.75 meters and powered by machines with an output of 1,800 HP. 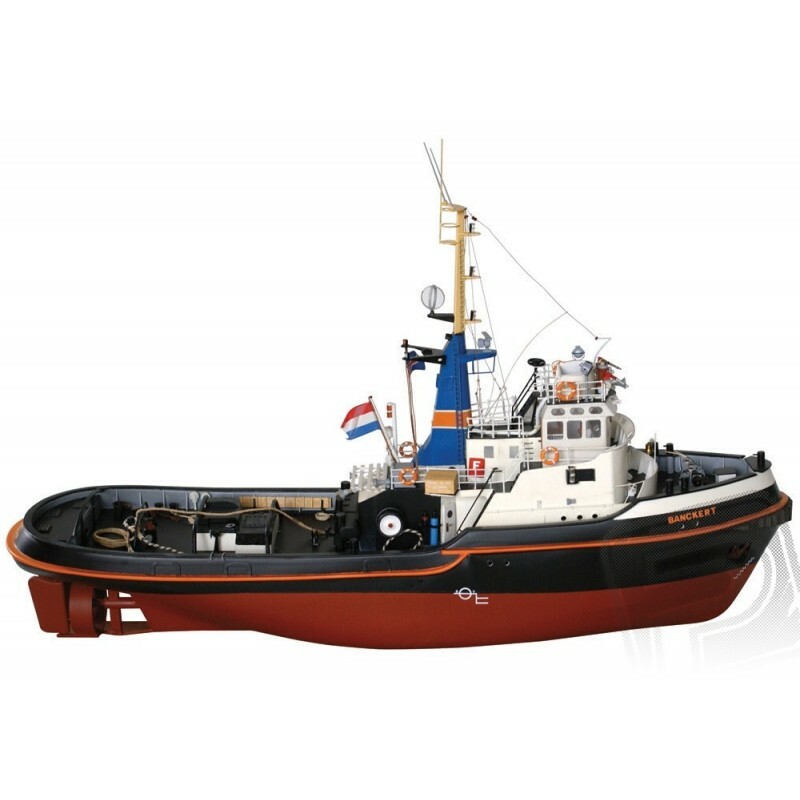 Kit in 1:50 scale is designed for moderately advanced ship builders. Banckert hull has formed plastic molding plywood with internal stiffeners, plastic deck and superstructure made of plywood and plastic parts. The kit includes a molded plastic hull and all other plastic and wooden parts needed to complete the model, dummy accessories (eg. Position lights, anchors, lifebuoys etc. ), marine shaft sleeve and the propeller. To drive model includes a DC motor range from 500 to 600, at least 30 A bidirectional controller (depending on engine) and 6-7 with articulated 2-3S NiMH or LiPo battery with a capacity of 3 to 5000 mAh. For basic operation, in principle, sufficient even the most ordinary two-channel radio system; to control the rudder servo meet the current standard. But for right maketáře of course, is "duty" adding as much maketových functions (lights, sound module, water cannon, maneuvering unit etc. ), which will require the use of multi-channel RC system - and the channel is never enough.